Produces a complete picture in frame in less than a minute. Does this marketing slogan sound familiar? Maybe more so than you think. A little over forty years before Edwin Land's landmark announcement of a camera that made "A Finished Picture in 60 Seconds," a new style of camera-the tintype street camera-was rapidly changing how people viewed and accepted photography. For a new breed of itinerant photographers, gallery quality images were not the desired goal. Instead, the objective was to make money by making pictures. The allure and excitement of being handed an image mere moments after the picture was taken, regardless of the image quality, kept people coming back for more. A secret to the rapid acceptance and success of tintype street photography was the adaptation of "dry" plate technology for tintypes. Unlike the earlier "wet" tintype process, "dry" photography did not require photographers to carry a darkroom. The "dry" process also gave builders the freedom to design smaller cameras that made it easier for photographers get closer to prospective customers. As the market for inexpensive tintypes exploded, a staggering diversity of tintype camera designs suddenly appeared; black leatherette boxes, cases with drop fronts and bellows, all metal "cannon" shaped apparatus, cameras with internal baths, cameras with external cylindrical shaped baths, simple to elaborate polished wood styles and so on. The rarely seen Quta Photo Machine is a fascinating example of one of the more unusual tintype street camera designs - actually "bizarre" is a better word to describe this ruggedly built little camera that made 2 x 2½-inch images. The earliest reference for the camera is a 1902 U.S. patent (#697,624) filed by Herbert E. Hickox of Great Yarmouth, England. The patent illustrates a two-part body design, similar to the pictured camera, but a simpler one-piece body was also offered. 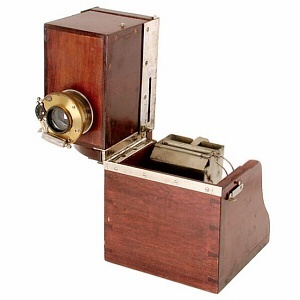 It is also believed that the "Popular" Automatic Ferrotype Camera (one-piece body) appearing in Jonathon Fallowfield (England) catalogues was a Quta camera. Although the actual production run is unknown, advertisements and pamphlets issued by the Quta Camera and Plate Company (New York) date from 1904 to 1907. These references indicate that the camera was primarily marketed and sold as a means to make money. A 1904-05 Gennert catalogue listing states that, "The Quta Photo machine or instantaneous tin-type camera is a thoroughly practical and economical machine for seaside and picnic work. It is extremely simple to operate, and as the finished photos can be delivered as fast as the sittings are made, it is naturally a cash proposition and a money-maker." The reference also mentions that finished images could "readily be sold for 15 to 25 cents each." Prospective Quta owners were also enticed by learning that the camera's portable size was ideal "for use at the seaside and other places of public resort, such as Fairs, Summer Resorts, Excursions, Lawn Parties, Exhibitions, Bazaars, etc." As far as operational simplicity; "A child can learn to operate it in two lessons, no previous knowledge whatever of photography being required." It's unknown if the Quta Photo Machine lived up to the advertising hype. But regardless of its success or failure, this camera and others like it evoked feelings of excitement and anticipation while waiting to see a picture in less than 60 seconds; the same feelings we get today when using a Polaroid or digital camera. In one smooth action, a fresh tintype was pushed into a recess in the wood panel and positioned behind the lens. The plate was then dropped into a developing bath located in the lower part of the camera by pulling open a metal trap door. The German Silver tank has two chambers; one for developing and a second for fixing the image. 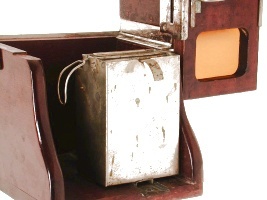 Essentially, the two-piece design had a camera in the upper portion the body and storage for a developing bath and spare magazine of plates in the lower part. Unhooking the upper half of the body (camera) allowed it to be rotated to an upright position for "landscape" images. at the rear of the camera was slid sideways.